Preliminary data from a protein skimmer study. I began a skimmer study to ensure maximum waste removal and to clarify what is being removed. My DYI skimmer was made from 24 inches of 4 inch PVC pipe, operated with a water down flow of 60 gallons per hour countercurrent to an air flow of 6 liters per minute through a basswood aerator. Over several months, skimmate samples, taken just after the skimmer was cleaned, were analyzed for color, NH3, PO4, and two phytoplankton species. Results seem to confirm that wet skimming removes more material per hour (higher recovery rate, light colored skimmate) than dry skimming (higher enrichment, smaller amount of darker skimmate often accompanied by a solid deposit on skimmer surfaces). Molecules that color the skimmate yellow to brownish likely represent a range of organic species. Measuring color intensity with a Color of Water Hanna Checker provided a means of estimating the amount of color producing molecules in terms of PCU’s (color intensity reported in platinum cobalt units). Full disclosure: the correlation between color intensity and the amount of color producing molecules in the skimmate is a reasonable but untested assumption of this approach. 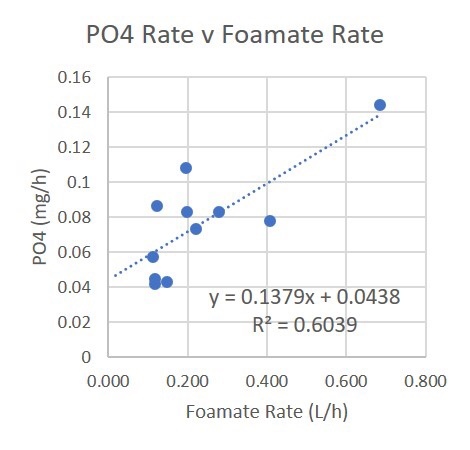 To calculate the amount of color removed per hour, the foam collection rate in liters per hour is multiplied by the color molecule concentration in PCU’s, giving the relative amount of material removed in units of PCU liter/hour. 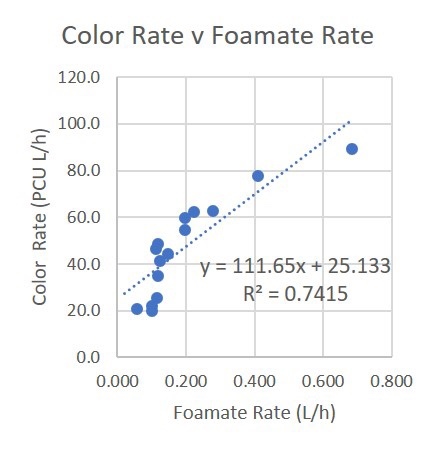 The graph of the data below indicates a substantially greater amount of colored material removed with increasing foam rate, i.e., wetter skimming removes more material per hour than dryer skimming. I know, skimming does not remove inorganic molecules, but I looked for ammonia anyway. 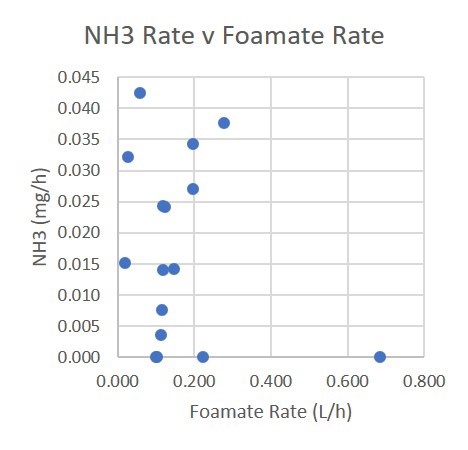 The salicylate method indicated a low level of ammonia but the amount varies in a seemingly random fashion and is not correlated with the rate of skimmate collection (see graph). Organic amines are known to interfere with this method and may explain the presence of ammonia in the test. I am doing more work to understand this situation. I looked for phosphate in the skimmate knowing that it shouldn’t be concentrated by foam fractionation. The data seems to indicate that it might (see graph) and the amount possibly correlated to foam rate. The mechanism for phosphate removal is not clear to me. Is it adsorbed to particles, inorganic or organic? Is it being liberated by the acidic conditions of the test? Further work is planned to understand this. I selected two phytoplankton to observe in the skimmate that were easily identified by their features, one a dinoflagellate and the other a diatom. 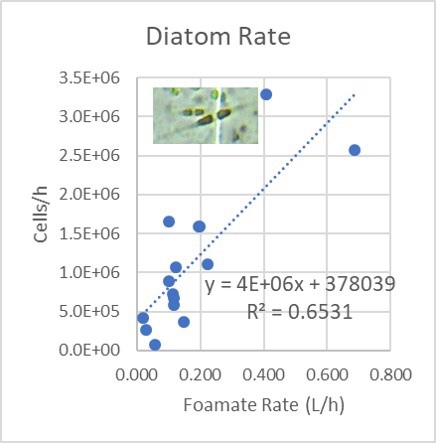 Both species cell count seemed to be correlated with foam rate (see graphs below). I will post results seeking to explain ammonia and phosphate in the skimmate. 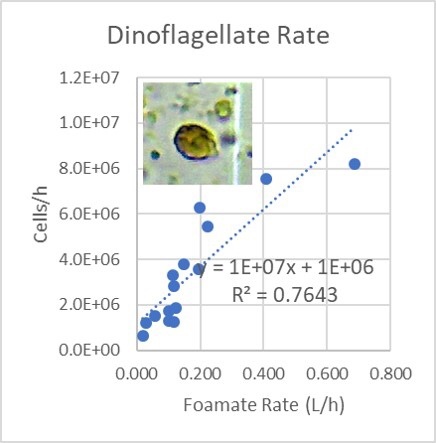 I am also attempting to develop a simple method for measuring the relative amount of dissolved organic compounds in foamate.